Icom IC-7800. Two Years warranty. 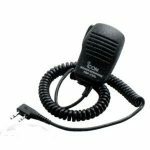 Icom has been developing radio communication equipment for over forty years. Its heritage has always been based on technical excellence from the first analogue PLL circuit in the IC-200, to the ground-breaking 32-bit floating point DSP of the IC-756PRO. 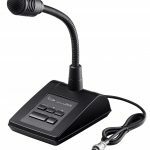 Ham radio stations increasingly use high power and high gain antennas that raise the field strength of unintended signals, and thus require a wider receiver dynamic range. 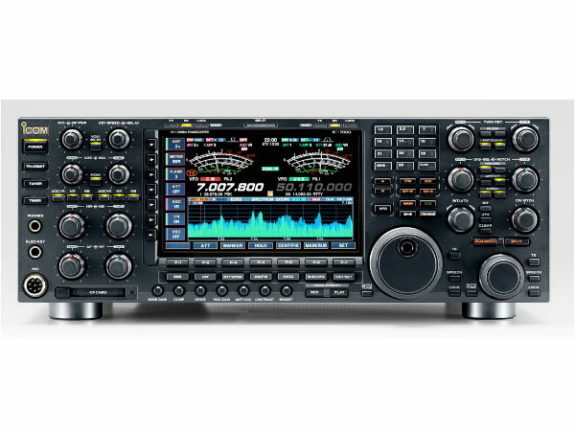 Icom has developed the flagship model IC-7800 which is a fusion of forty years analogue RF circuit development expertise, with cutting edge digital technology. The result is 110dB dynamic range, +40dB 3rd order intercept point in HF bands and other phenomenal performance features. The receivers combine various current and new technology, to obtain the +40dBm IP3. Icom’s 40 years of analogue RF circuit experience combined with cutting edge digital technology results in an astonishing 110dB receiver dynamic range and a +40dBm IP3 in the HF bands. A first in Ham radio! To achieve this superior receiver performance, Icom’s engineering team completely reviewed the whole analogue circuit and matched it to the DSP units. This allowed us to explore new technical dimensions such as a double conversion super-heterodyne system, mechanical relay BPF switching and two roofing filters. The IC-7800 uses highly reliable and durable mechanical relays for BPF switching instead of non-linear semi-conductors which cause distortion. The mechanical relay prevents 2nd order distortion at the primary stage of signal processing. The IC-7800 has two roofing filters before the 1st IF amplifier stage. One is 15 kHz filter for FM mode and the other is 6kHz filter for SSB, CW, AM and data modes. The IC-7800 switches between these two roofing filters depending on operating mode. 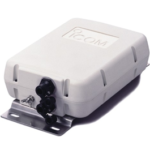 Typically, transceivers use only one broad 15 kHz roofing filter for all modes. This is not an optimal design for SSB, CW, or AM modes. The two roofing filters dramatically improve the blocking characteristics from strong adjacent signals. The pre-selector works from 1.5MHz to 30MHz. The pre-selector automatically tracks the intended signal, keeping the pre-selector’s bandwidth centred on the operating frequency at several kHz steps (minimum). The pre-selector rejects unwanted out of band interference from multi-multi operation or strong broadcast stations, as your first line of defence against interfering signals. The centre frequency of the pre-selector is adjustable from the DIGI-SEL tuning knob on the front panel. While mixers often become a cause of signal distortion and spurious emissions, the IC-7800 utilises a double conversion super-heterodyne system using a newly developed image rejection mixer. A high performance D-MOS FET array for the 1st mixer stage is infused with a signal from the high-level C/N, high-drive Local Oscillator from the PLL unit. This new mixer reduces signal distortion through IF processing and provides a high-fidelity signal to the DSP unit. The IC-7800 has two types of AGC loops. One of the AGC loops detects the AGC voltage at the BPF input in the DSP unit and feeds back to the 1st IF amplifier. This AGC loop prevents the saturation of the 1st IF amplifier from strong signals out of the BPF bandwidth, and improves the dynamic range against adjacent signals. The other AGC loop detects the AGC voltage at the digital IF filter output which has only passed the intended signal and draws the full potential from the digital IF filter. Combining the digital IF filter, manual notch, and the 1st IF stage, these are all controlled by the DSP unit. 110dB of ultra wide dynamic range in the receiver means the IF amplifier is distortion free from strong signals. The ultimate dual receiver performance is at your control; the receivers are completely independent all the way from the 4 antenna jacks, through the pre-selectors, DSP, signal detectors, front panel control, and right into the stereo headphone! The dual receiver allows you to receive two different bands simultaneously in different modes, with each receiver not causing any adverse affect to the other one. This true dual receiver takes your band hopping and contesting experience to the next level! In addition to the preset AGC time constants (slow, medium and fast), the manual AGC volume provides flexible detailed AGC tuning. The digital IF filter has superior filtering performance and a distinguished shaping factor that demonstrates the power of 32-bit floating point DSP. The digital filter is completely free from deterioration due to deviations in band characteristics, temperature change, or mechanical vibration, all of which have likely been seen with analogue filters. The digital IF filter also provides excellent ripple characteristics and clean cut that have never been available with analogue filters. The filter shape is selectable from soft and sharp, depending on the purpose, operating band, band conditions, etc. It is also possible to set CW and SSB filter characteristics independently, and also select the filter shape while actually receiving a signal. The IC-7800’s manual notch filter shape can be set in 3-steps for the various receiving conditions. The manual notch filter has extremely sharp characteristics for processing in the DSP and provides tremendous performance for attenuation levels of more than 70dB in all shapes. The DSP-based manual notch provides stable performance and completely shuts off undesired beat signals without affecting AGC gain. In addition, an automatic notch filter tracks and wipes off the beat signal and RTTY interference. The IC-7800 uses four pairs of 32-bit floating point DSP units and 24-bit AD/DA converters. One for the transmitter, one for each receiver, and the final one for the spectrum scope. The DSP units deliver the phenomenal performance of the digital signal processing. A powerful combination born of Icom’s analogue RF technology and experience. The newly designed push-pull power MOS-FET amplifiers work with 48V DC and provide a powerful 200W of output power at full duty cycle with low IMD in all bands. The digital PSN modulator using a dedicated DSP unit consistently reproduces an outstanding signal-to-noise ratio, providing clean and clear transmission. Your IC-7800 will be the reference point on the band with a standard stability of +/-0.05ppm! Even on the 6m band, that is less than 3Hz error from the Oven Controlled Crystal Oscillator! Also, a 10MHz reference frequency can be the input/output for external equipment. The IC-7800 has a modulator and demodulator for the 2 major HF ham digital modes. Encode and decode of PSK31 and Baudot RTTY signals are possible by simply connecting a USB keyboard to the IC-7800. The twin peak audio filter improves RTTY reception. In addition, transmitted and received messages can be stored to the CF memory card and transferred to your PC. With the dedicated DSP unit, the spectrum scope provides 80dB dynamic range of signal processing (the IC-756PROII is 60dB). The scope span can be set to +/-2.5 to +/-250kHz in 7 steps, providing wide band signal analysis. The monitor range can be set independently from the receiving frequency. You can monitor the band condition between the selected sweep edges, as well as sweep a selected band width centred on the receiving frequency in the scope screen. In addition, the scope has many features including scope attenuator (10dB/20dB/30dB), 3 types of marker (Main band, Sub band, Transmit), Max hold function and Main- Sub band one touch switch. The mini scope function is convenient for continuous monitoring even while adjusting the set mode. 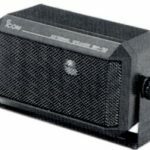 The built-in audio equaliser has the separate bass and treble adjustment for a total of 121 combinations, so you can tone your voice up or down as you want. In addition, the transmit bandwidth is selectable.